Port Louis (French: Port-Louis, Mauritian Creole: Porlwi) is the capital city of Mauritius, located in the Port Louis District, the western part also lies in the Black River District. 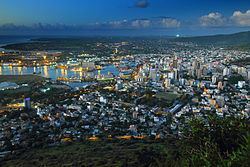 Port Louis is the country's economic, cultural, political centre and most populous city. It is administered by the Municipal City Council of Port Louis. According to the 2012 census conducted by Statistics Mauritius, the population was 149,194. Port Louis was already in use as a harbor in 1638. In 1735, under French government, it became the administrative center of Mauritius and a major reprovisioning halt for French ships during their passage between Asia and Europe, around the Cape of Good Hope. The Port is named in honor of King Louis XV. 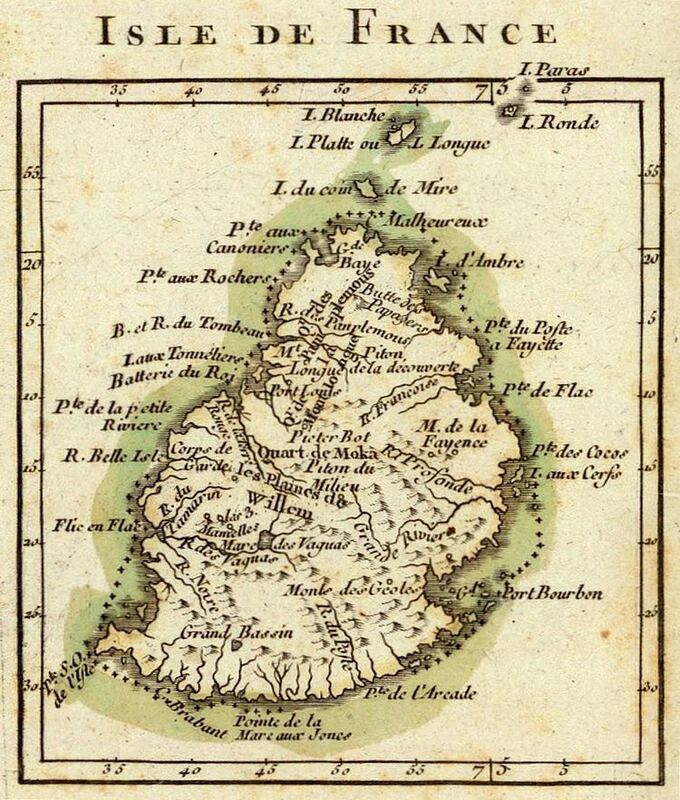 During this period of French colonization, Mauritius was known as Ile de France. The French governor at that time, Bertrand-François Mahé de Labourdonnais, contributed to the development of the city. Since Port Louis was relatively well-protected from strong winds during cyclones by the Moka Mountain Range, Port Louis was selected to house both the main harbor and fort for the island. Value of the port continued during the British occupation of the island during the Napoleonic Wars (1800–15), and helped Britain control the Indian Ocean. However, port calls of ships fell drastically following the opening of the Suez Canal in 1869. Activity in the port increased during the seven-year closure of the Suez Canal (starting in 1967). Modernization of the port in the late 1970s has helped it maintain its role as the central point for all imports and exports from Mauritius. While Port Louis continues to be the business and administrative capital of Mauritius, expansion of the tourism industry in the late 1990s led to considerable development in Port Louis, with many shops, hotels, and restaurants being built in the Caudan Waterfront area. Port Louis is home to the nation's main harbor, and is the only official port of entry and exit for sea vessels in Mauritius. Ships must cleared in the port before visiting any other anchorage in the island nation. The Mauritius Ports Authority (MPA), established by law in 1998, is the port authority responsible for Port Louis. The MPA provides port infrastructure, enters into contracts with private providers for port and cargo-handling services, promotes the use and development of the ports, and licenses and regulates port and marine services. The harbor adjoins the main city, with the port currently comprising three terminals. Terminal I contains a total of 1180 meters of quay, with six berthing positions for cargo, passengers, and fishing boats. Terminal II contains 986 meters of quays with six berthing positions, and includes specialized facilities for handling and storing sugar, fish, tallow, and caustic soda. In particular, the Bulk Sugar Terminal (operated by the Mauritius Sugar Terminal Corporation) can handle vessels with up to 11 meters of draft, can load sugar at a rate of 1450 tones per hours, and can store 175,000 tons of cargo. Also present in Terminal II is a dedicated 124-meter cruise ship jetty, with a dredged depth of 10.8 metres. Terminal III has two 280-meter quays with a depth of 14 meters, and is specialized for handling container ships, having five post-Panamax gantry cranes. Also present are storage facilities for bulk ethanol and tie-in points for reefer containers. Vessels too large to dock at the quays can anchor at the Outer Anchorage, which is still within the official boundaries of the port. Berthing facilities are available at the Caudan Waterfront. Available are 20 berths with electrical and water connections, showers and toilets, laundry, and vehicle parking. Also available are dry dock and hull and sail repair facilities. Depths of the berths range from 2 to 4 meters, depending on the tide, and up to 30-meter ships can be accommodated. Also based in the port is the National Coast Guard facility, at Quay A of Terminal I. Port Louis is the financial center of Mauritius, which has established itself as safe and trusted location for conducting business due to its strong democracy, political stability, and multilingual population. Located in Port Louis is the Stock Exchange of Mauritius. 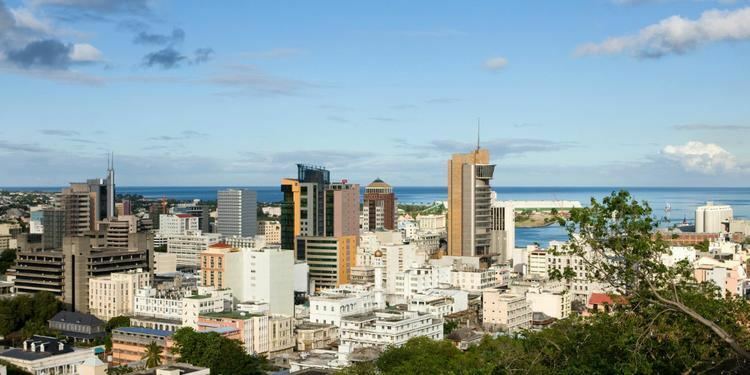 Also in Port Louis are over ten commercial banks that serve both domestic and offshore clients, insurance companies, pension funds, mutual funds, leasing companies, and foreign exchange dealers. The oldest bank based in Port Louis is the Mauritius Commercial Bank, which was founded in 1838. The Bank of Mauritius is the central bank of the country. Measuring 124 m (407 ft) from ground level to its pinnacle, the Bank of Mauritius Tower is the tallest building in the country. Port Louis is served by two major bus stations. Victoria Station is used by buses to and from the eastern and southern areas and the Plaines Wilhems district. Immigration Square, also known as Gare du Nord, is a terminus for buses coming from the northern districts of Pamplemousses and Rivière du Rempart. A number of inter-city buses carry passengers to and from nearby suburbs such as Plaine Verte, Vallée-des-Prêtres and Cassis. Most streets in Port Louis are laid out in rectangular grids, and many are one-way. Although most roads are in good shape, many streets are fairly narrow as would be expected for a historic colonial town. Due to the daily influx of workers to business and government offices in Port Louis, day-time traffic can be quite heavy and finding parking spaces a challenge. To cope with increasing traffic congestion, the government has proposed a light rail transit system. Other suggestions have included moving some of the 24 government ministries currently located in Port Louis to surrounding regions, or introducing flexible work schedules. An effort to move workers from the city center has already started with the construction of the Ebène office tower complex south of Port Louis. A ring road passing on the east side of Port Louis is also expected to reduce congestion. Phase 1 of that project was completed in 2013, but in February 2014 the road needed to be closed due to the appearance of a major crack, apparently due to faulty design. Another project initiated to reduce congestion is the construction of a bridge (commonly referred to as the "Dream Bridge") from Les Salines to Roche-Bois, which will span the Port Louis harbor. In 2012, the government decided to construct an approximately 25-km rail system between Curepipe and Port Louis, which had been under consideration for nearly three decades. The project was initiated by a government-to-government agreement with the Singapore Cooperation Enterprise (SCE), along with private partners Singapore Mass Rapid Transit (SMRT) Corporation and the South African/Australian engineering firm Aurecon Ltd. The goal was to develop a preliminary plan of the system, and then solicit expressions of interest for a design-build-operate-finance scheme, with a concession period of 33 years. As of May 2014 a concession has not yet been awarded. The current plan includes a northern terminus at Port Louis' Victoria Station. This would restore passenger rail service to Port Louis for the first time since March 1956. But till now, nothing has developed. Primary and secondary schools in Port Louis include state-run and private institutions. Most private schools receive much of their support from the government, based on a formula where the government pays staff wages and operating expenses based on a grant formula. Other costs are covered by students and their families, such as books and uniforms. The government also provides private schools with loans at preferential interest rates to help upgrade facilities. The state-affiliated schools include those operated by MEDCO (Mauritius Educational Development Company), which is a partnership between the Government of Mauritius and the State Investment Corporation. Port-Louis houses the best secondary boys-only school of the island, the prestigious Royal College Port-Louis, Alpha College, Bhujoharry College, Labourdonnais College, and Port Louis Academy, Loreto College, Madad Ul Islam Girls College, Muslim Girls College, City College, Full Day School, Institute of Islamic and Secular Studies, London College, Ocep The Open College, and Port Louis High School, MEDCO Trinity Secondary School, MEDCO Trinity Secondary School, Port Louis North SSS, and Sir Abdool Razack Mohammed SSS, Goolam Mohammed Dawjee Atchia State College, MEDCO Cassis Secondary School, Renganaden Seeneevassen SSS, and Port Louis SSS. The state also operates a vocational school for boys, Immaculee Conception SSV. The major institute of tertiary education in Port Louis is the University of Technology, Mauritius, a public university with a technology focus. The École de Medecine Louis Pasteur prepares students for medical studies at Universite de Lille in France. Several technical schools also have locations in the city, including the Jhurry Rya School which specializes in information technology, Appavoo Business School, Apollo Bramwell Nursing School, BSP School of Accountancy & Management, and the London College of Accountancy. I think Port Louis is — pound-for-pound — one of the greatest little cities in the world. Port Louis simply seems to have everything and the human productivity and hustle to drive it all. While some offices are slightly dusty, or perhaps a bit small by modern standards, you can get trousers shortened or eat dumplings between meetings. You can go to a museum, buy cheap sunglasses and walk along the Caudon without having to extend your lunch break. The city is full of numerous buildings and monuments that reflect its rich and diverse colonial history. Near the city center, there are several French colonial buildings that date to the 18th century, including Government House. Other prominent traditional elements include the Jummah Mosque, the majestic English Saint James Cathedral, the Indian Tamil Temple, the elegant five-tier colonial Port Louis Theatre (Théâtre de Port-Louis), the Champ de Mars Racecourse, and the nearby Chinese Pagoda. Also present are some typical houses from past eras, which are mostly wooden structures with shuttered windows and large porches. However, most homes and commercial structures are now constructed from more durable materials such as concrete, and the city now includes many glass/concrete high-rises. The Pagoda is a central feature of the Port Louis Chinatown, which is one of several Chinatowns in Africa. Its entrance is marked by a large "friendship" gate, just east of the Central Market. The site was the traditional location of homes and shops of the Chinese community, which was dominated by descendants of the Hakka Chinese, who first came to Mauritius in 1826. Chinatown is now home to a more diverse community, but preserves its original appearance and contains many small shops and restaurants. Its old buildings and Chinese pagodas face the modern buildings of the city's business center. The Chinese Chamber of Commerce (founded in 1908 and second only to Singapore as the world's oldest) hosts a popular food and cultural festival each April or May. The Chamber also runs a funeral parlour for the Chinese Community called ‘Kit Lok’, to provide vigil facilities for bereaved families. Port Louis has been an active cultural city attracting painters, poets, sculptors and writers for centuries. Marie-Thérèse Humbert wrote her famous novel, La Montagne des Signaux, with Port-Louis in mind. Malcolm de Chazal was a common Mauritian visionary writer and painter who was often seen in the capital, mostly at the central market, Champ de Mars and l'hôtel National. Robert Edouard-Hart, a great poet found in this very active city a source of inspiration. Port-Louis born poet and semiologist Khal Torabully, the foremost poet of indenture and coolitude, recently designed Travellers' Lane at the Jardin de la Compagnie, inaugurated by Navin Ramgoolam, the Mauritian Prime Minister and the Parcours Culturel with aphorisms of Malcolm de Chazal, just facing the famous Port Louis Theatre. That theater, still in use and catering mostly to presentations of classical music, jazz, and local drama, has a distinguished history that includes the first presentation of opera on the island in the 19th century by traveling European troupes. The Blue Penny Museum is located at the Caudan Waterfront, and is dedicated to the history and art of the island. Its collection includes antique marine maps, paintings, sculptures, engravings, and stamps, including examples of the famous orange-red one penny and deep blue two pence stamps. The Natural History Museum of Port Louis houses exhibits of the impressive fauna of Mauritius, with a gallery devoted to birds and terrestrial animals, a second focusing on marine species, and a third focused on the dodo, the famous Mauritian bird which became extinct during the Dutch occupation. The Mauritius Postal Museum is housed in an old stone building that dates to the 18th century, and houses displays of stamps and postal paraphernalia from Mauritius and around the world. The Mauritius Photography Museum, located in a small 18th century white-washed French colonial building, is a private museum that displays artifacts and documents about Mauritian photography and the early days of cinematography. The China Heritage Museum, located in Chinatown, displays historical items representing the daily life of the Chinese community. Currently closed for renovation (2014) is Aapravasi Ghat, which is the remains of the immigration depot that was built by the British Government to import laborers from India, Eastern Africa, Madagascar, China and Southeast Asia to work on the island’s sugar estates. Although not a museum in a traditional sense, the National Library of Mauritius houses a rich and comprehensive collection of material related to Mauritius history, including manuscripts, books, newspapers, periodicals, music scores, photographs, maps, drawings and other graphic art forms and audiovisual materials, in addition to providing the traditional services of a library to residents of the city and nation. Local governance of Port Louis is overseen by a municipal council. The City Council of Port Louis was first established in 1830 and is currently one of five municipal councils responsible for the urban areas in Mauritius, as organized under Local Government Act 2011. Twenty-four councillors are elected democratically to administer the council. Councillors then elect a Lord Mayor and a Deputy Lord Mayor. Functions of the council are performed through Departments of Administration, Finance, Land Use and Planning, Public Infrastructure, Public Health, Welfare, Parks and Gardens, and City Library. Services delivered by the local government include pre-school, kindergarten, and vocational schools, health protection, housing regulation, some road services, refuse collection, cemeteries, some environmental and consumer protection services, and economic promotion activities. Other services are provided to the city by the central government. 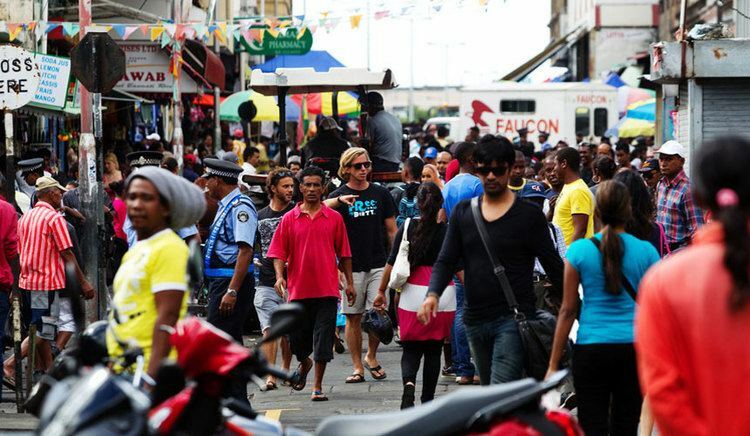 These include police services through the Mauritius Police Force, which maintains two divisions responsible for the Port Louis area (Metropolitan Divisions North and South). There is also a specific Port Police, composed of the Harbour Police and Bulk Sugar Terminal Police. Their roles include providing security to cargo and facilities in the port area and enforcing laws related to harbor regulations, customs, quarantine, immigration, and drug trafficking. Sports are popular among the inhabitants of Port Louis, as in the rest of Mauritius. Over 35 sports federations are organized under the aegis of the Mauritius Sports Council. Popular activities include football, volleyball, a range of martial arts (Karate, Taekwon Do, Wushu), table tennis, badminton, and pétanque, which is a form of boules. The Mauritius National Olympic committee is also based in Port Louis. Public sports facilities in Port Louis include St. François Xavier stadium, which is used for football. There is however a general dearth of public facilities in Port Louis proper, with most being built in the surrounding less-densely inhabited suburbs and districts. Football clubs are organized nationwide by the Mauritius Football Association, which currently has ten teams in its Premier League. This includes the Port Louis team, named the Association Sportive Port-Louis 2000 (AS Port-Louis 2000), which won the national championship is 2003, 2004, 2005, and 2011. Another popular sports activity in Port Louis are the Thoroughbred horse races held at the Champ de Mars Racecourse, which is the second oldest horse race track in the world. Gambling on the horse races can be done both with bookies and the tote, available at multiple locations inside the grandstand. Gambling in general is a popular "sport" in Port Louis. Besides at the racecourse, within Port Louis gambling can be done in four casinos which offer table games plus gaming, slot, and video poker machines. Port Louis includes the largest casino in the entire country of Mauritius, the Caudan Waterfront Casino at Labourdonnais Waterfront Hotel. Other casinos are the Le Grand Casino du Domaine, L'Amicale Casino, and the Senator Club.